This is compromise food. 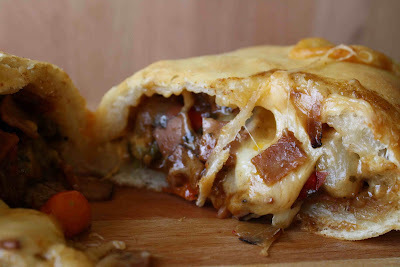 It's dough filled with cheesy goodness for the boyfriend, but jam packed with veggies for me. We needed an afternoon snack and half of this was the perfect answer. A whole one can definitely serve as a meal for two people. If using frozen roasted vegetables like Trader Joe's, cook them according to package instructions, adding the cubed ham at the end to warm through. Roll out the pizza dough to a rectangle. Sprinkle 1/2 cup of cheese on one half of the rectangle, leaving a 1" border from the edge. Pile the roasted vegetables on top of the cheese and cover with the rest of the cheese. Fold the other half of the pizza dough over the filling and press the seams down with a fork to seal. Cut a few vents in the top to allow steam to escape and bake on the pizza stone for 35 - 40 minutes. Enjoy! looks scrumptious! Your boyfriend must worship the ground you walk on-serving up all the delicious gems that you do. This looks great for the kids. I love black forest ham-especially Boar's Head Brand. My eyes just fixed onto that goey goey cheese! Perfect for lunch and oh what an easy thing to make, yet it guarantee tastes good. Rachel - One would hope! He definitely gets very sad when he sees something on the blog that he didn't get to try. Candy - It's great for kids and boyfriends who may not always want to eat their Veggies! Cecil - It's all about the cheese on this one! Elra - It is very simple, which is why I love it. There's nothing better than delicious simple food.